is a region centre in the Pskov area in 52 km to the west from Pskov. The town is located in 3 km from the railway station of Pechory-Pskovsky along the line Pskov Ц Valka. The population is 12,4 thousands people (1992). 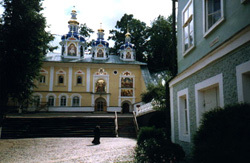 The general sight of the town is the Pskovo-Pechorsky monastery, located in outskirts of the town. The ancient Russian town of Pechory, a centre of the district of the same name of Pskov area, is located today, as well as hundred years ago, on the western border of Russia. Near there is the next state Estonia which don't forgotten, that recently the Pechory district belonged to it, and its main town was named "Petseri". However it proceeded not for long. 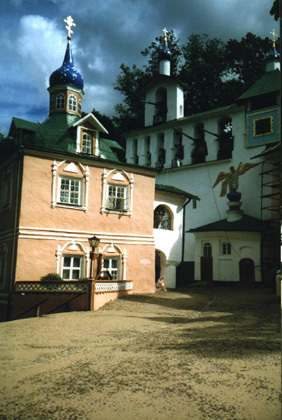 And Pechory are famous in the whole world by unique and charming ancient Russian architectural ensemble, which, as if a gold nut from a fairy tale, is surrounded by fortress walls and towers. The tower of the Lower Lattices. The natural shape of the district was formed in ice-age and post-ice-age. The traces of glacier presents large hills near the town of Pechory. In the district near to Estonian border the pine woods were saved, recently they covered the whole territory of Pechorsky district. Through the territory of the district and the town the important transit ways, connecting the central and the northern-western areas of Russia with Estonia and Latvia, pass. From Pskov to Pechory it is 47 kilometers by railway or 52 kilometers by a highway. 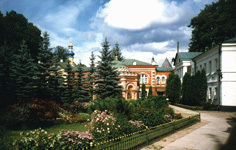 Pechory is the modern growing comfortable town with the advanced system of life-support both townspeople, and tourists. Its main sight is the remarkable monastery-fortress on the ancient abrupt coasts of the brook of Kamenets. Hasten to look at this miracle! The Tajlovskaja tower and the part of the fortress wall. 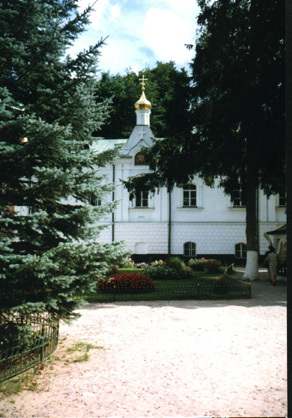 The Pskovo-Pechorsky monastery was founded near the river of Kamenets, on an abrupt slope of ravine. There is a legend, that once here a hunter suddenly heard a church singing. He decided, that there were the singing angels. Probably, there the monks, settled in natural caves on sandy slopes, sang. Later these caves were found out by a local peasant. The date of their finding the monastery chronicle determines as 1392. The chronicle says, that the founder of the monastery was the priest Ivan, run from Derpt in 1472. This priest founded a monastery at the border with Livonia as a stronghold in struggle with western enemies. He dug out in the mountain a small cave church, which was consecrated in 1473. However dangerous neighbourhood with Livonia, whence constant ruinous raids were made, did not allow to develop the monastery. It began to grow and to grow rich only after a joining of Pskov to the Moscow state under Misjur Munekhin, which with support of great Moscow prince began intensive civil work. In the 16th century the monastery became especially stronger and grown rich under priest Kornilij, governed the monastery from 1529 till 1570. 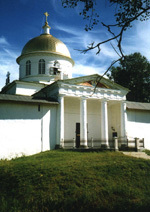 Then around the monastery the fortress walls with nine towers and three gates were constructed, and inside the stone Blagoveshchenskaja church and the gate Nikolskaja church were constructed. The icon workshop was arranged, the Pskov third chronicle was began. The number of the monks increased. The fortress wall with the Ostrozhnaja tower. The view from inside. The tsar Ivan Grozny loved the monastery. 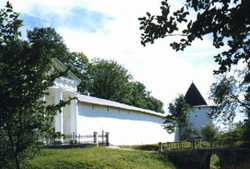 The Pechorskaja fortress played an important role in the Livonia war, protecting western Russian boundaries. 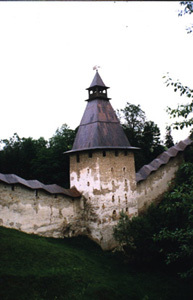 During Livonia and Northern wars the monastery-fortress many times repulsed the attacks of enemies. In the fortress there constantly was a strong garrison of Russian army, which battled side by side with the local population. The Uspenskaja (the 15th century) and Pokrovskaja (the 18th century) churches. 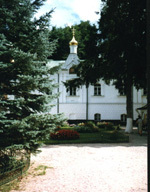 The end of the Уblood wayФ and the main square of the monastery. As the award for a service and a fidelity the Russian tsars generously awarded the monastery becoming the largest and rather rich land owner. 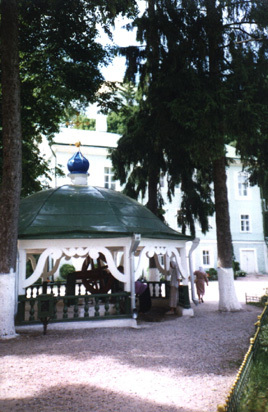 However in the 18th century under Ekaterina II all the monastery grounds passed to the state, and then they were distributed to the landowners. But the monastery grew rich not only by grounds. There were also many treasures, a lot of them were given by tsars, great princes and rich landowners. Unfortunately, all this was plundered by invaders during Great Patriotic war and only partially returned subsequently. After October revolution the town repeatedly passed from hands in hands. Under the agreement of 1920 Pechory and Izborsk with vicinities passed to Estonia and began to be named "Petseri" and "Irboska". In 1940 Estonia was joined to Soviet Union. During the Great Patriotic war all district was occupied by German troops, there was persistent guerilla warfare with large losses, and only in August, 1944 Pechory were liberated, and in January, 1945 the special governmental decree formed the Pechorsky district in structure of Pskov area. 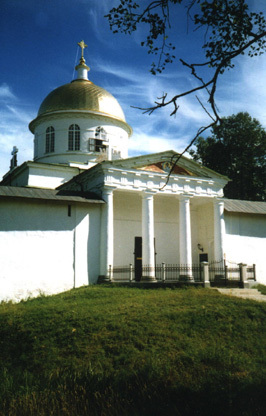 The ancient Russian town received again the name Pechory, and the perfect Pechorsky monastery-fortress after realisation of the restoration works attracts an attention of amateurs of beauty and antiquities. The tower of the Upper Lattices. Certainly, the unique appeal of Pechorsky ensemble is determined first of all by nature-topographical features of these places. That circumstance is very important, that the first cult premises arose in natural caves on an abrupt slope of ravine, subsequently extending already by people hands. The place was loved and became known in all district. The new structures began to be constructed in immediate proximity of the cave church. As on abrupt coast of the brook Kamenets there aren't convenient sites for construction, the architects and builders had to put buildings rather inventive: very close, at different levels and under different corners, keeping thus free opened spaces. This caused the "unpredictability" of location of picturesque monastery buildings, which are perfect by the architectural qualities and cheerful colouring contrasting with a severe stone of fortress walls and towers. The fortifications of the 16th century, going on the top of ravine and downwards on its slope, rising on other slope and again descending to the river, are interesting. The common length of walls is 726 meters, thickness is 2 meters. From 10 towers only nine are survived: the Tajlovskaja; the tower of Top lattices, highest, stands at the bottom of ravine in its top part and misses through the lattice the water of the river; similar to it, the tower of Bottom lattices, too at the bottom of the ravine; the tower of Tararygin or Naugolnaja; the Izborskaja tower with the gate to the road to Izborsk; the Blagoveshchenskaja tower (near the Blagoveshchenskaja church); the Nikolskaja tower with the gate church of Nikola Ratny, attached in the 17th century above entrance gate, being the modern entrance in the fortress; at last the small round Tjuremnaja (Prison) (or Ostrozhnaja) tower. The Nikolskaja church with the belfry. The 16th century. The beginning of the Уblood wayФ. 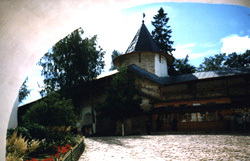 Inside the fortress at the top level the Nikolskaja church with the belfry of the 16th century is located. 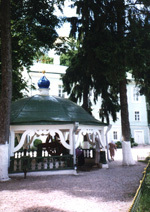 The belfry was constructed by the architect A. I. Ruska in 1827. 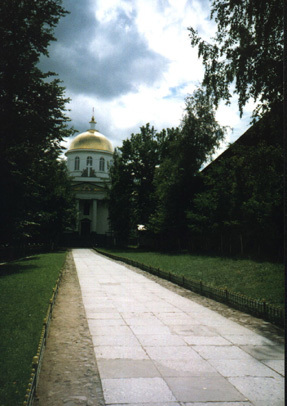 There is the Mikhailovsky cathedral, to which on top of the ravine the birch avenue lead. At the bottom of the ravine there isn't more the brook, blocked in a pipe. The place, where it flowed, designates only by the ancient well, formerly supplying the defender of the fortress by water. Just here the most ancient and interesting buildings of the monastery are located. There is the Uspenskaja church representing to the moment of its consecrations in 1473 a small cave, dug out in the sandy slope and then deepened and strengthened outside by facade wall. 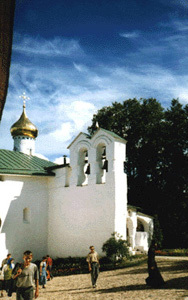 In the 18th century above it the Pokrovskaja church, with which it has now common facade, was built. Near the caves there is the Large belfry of the 16th century, above which in the 18th century an additional span for the bell, presented by Peter I, was built. Under his command on the gate Petrovskaja tower the arms of Russia was put, as a recognition of nation-wide importance of the fortress. To the belfry the Chasovaja tower with clock adjoins. The clock is connected with bells, beating off each quarter of hour. To the north there are the Riznitsa, the Sretenskaja and the Blagoveshchenskaja churches of the 16-17th centuries incorporated in one building. 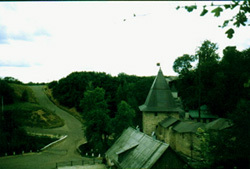 At some distance there is the Lazarevskaja church of the end of the 18th century. We should tell, that any enumeration of objects, any illustrations and any most detailed and the colourful plan are not capable to give real representation about Pechorsky ensemble. It is necessary to be immersed on the bottom of ancient ravine and to reach this fantastic empire of Russian art. On the left side there is the Sretenskaja church, behind it Ц the Blagoveschenskie churches of the 16th century. The Bolsaja belfry. The 16th century. The Mikhailovsky cathedral. The 19th century. The Mikhailovsky cathedral. The western facade. 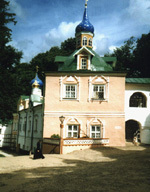 The Pechorsky monastery. The view from the main square to the north.